Tomáš Štrauss (1931-2013) was a Slovak art historian. He studied at the College of Political and Economic Sciences and at the Faculty of Philosophy and History at Charles University in Prague. After 1968, his pedagogical and publishing activities were restricted, while he actively worked in the alternative culture. Upon the invitation of DuMont publishing house in 1980, he moved to Germany. He lectured at several universities abroad. From 1955, he has published almost 700 expert studies, reviews and articles in journals. 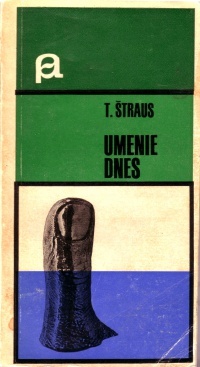 Umenie dnes: pokus o kritickú esej, 1968, Log, PDF. This page was last modified on 10 September 2017, at 12:05.